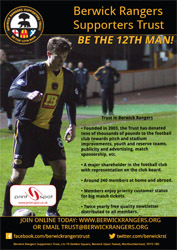 Berwick Rangers Supporters Trust is launching a new recruiting poster. Designed by Brendan Thorburn and using a photo of Berwick’s Stevie Notman in action courtesy of Alan Bell, it has been printed and sponsored by Print Spot of Berwick ( www.print-spot.co.uk ). It comes in two different sizes. The bulk of the new posters are A5 in size but a quantity of a larger A4 version has also been produced. The poster gives information on how to join the Trust. Membership forms are also available in the club shop at Shielfield on home match days.